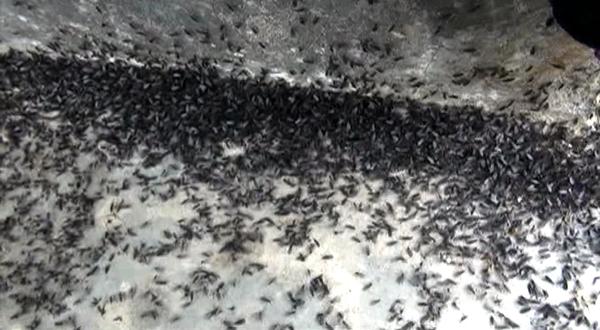 The residents of Trongsa town saw swarms of tiny black flies invade their homes and surroundings in the recent days. The black flies first appeared two weeks ago and have grown in number by the day since. The National Plant Protection Centre (NPPC) examined the samples received from the dzongkhag yesterday and has confirmed it as an outbreak of dark-winged fungus gnats. The centre says the dark-winged fungus gnats are commonly associated with decomposing organic matters where the larvae feed on bacteria and fungi. “The only way to do anything about them is to reduce the availability of the larval habitat by removing wet, decaying organic matter in the surrounding areas,” the NPPC says. The tiny creatures are everywhere from homes to fields, walls, plants and on the roads. Apart from being a nuisance, the outbreak has the town residents worried. They fear it might cause diseases and harm crops. “They are annoying. The windows and doors have to be kept closed always or they would enter our homes,” Phurba, a resident, said. “It’s giving us a lot of problems. They sit on cakes and other food items. We have to clean six to seven a day to get rid of them. More flies are coming with each passing day,” Komla Maya, a confectionary owner, said. However, the NPPC says the fungus gnats do not pose a real threat to human health. As for the threat to crops, agriculture officials said there have been no reports of crop damage from the outbreak so far. “We haven’t even received any reports from the gewogs. Currently, it is seen only in the municipality area. It could be infectious, so we can take precautionary measures like keeping our surroundings clean in order to avoid contact with the flies,” Karma Chewang, a district agriculture official, said.